The kids have been hearing me talk about the Sand Hills for years, and they were anxious to see the place where I grew up. I told them how my ancestors homesteaded the country, described by some as the great American desert, after the Civil War. 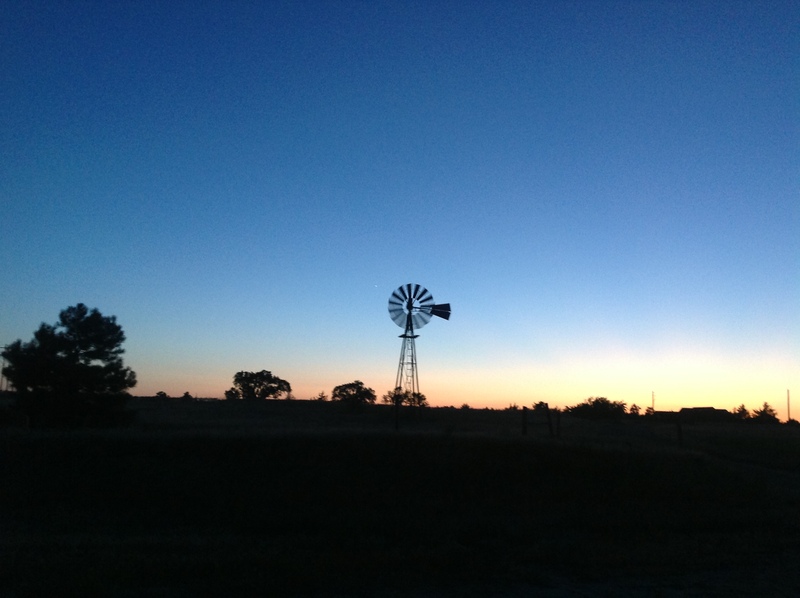 The ranchers built windmills to pull water up from the Ogalala aquifer to water their cattle. With the introduction of the center pivot sprinkler in the 50s, which allowed crop irrigation, ranchers have been turning the prairie and farming some of the land. 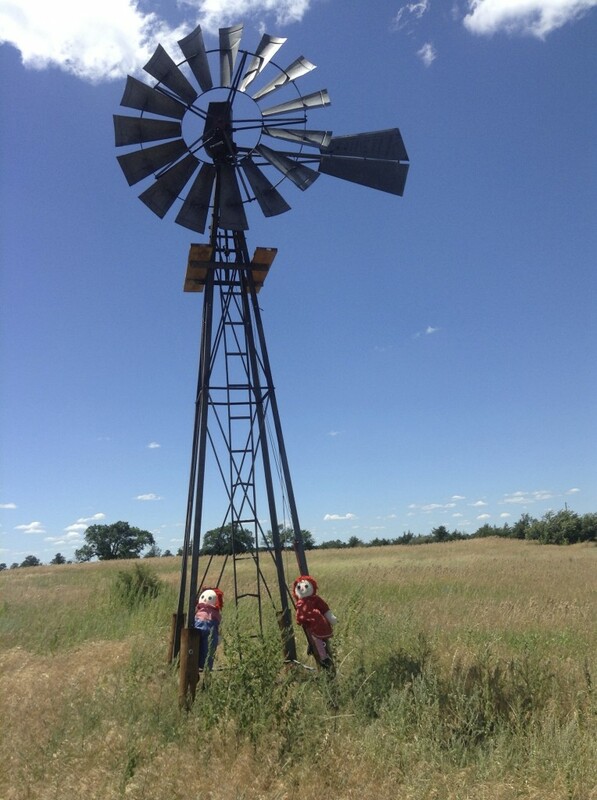 Ann and Andy fell in love with the windmills. We stopped by one in use outside of Long Pine, and the two of them insisted on climbing and posing on it. Andy loved the creaking sounds the blades made as they turned in the light wind. When a few slow-moving Herefords turned in their direction, the kids scurried back to the car. I told them the story of the time my brother Mike and I were walking home from school and decided to challenge an old bull in a pasture across the road from our house. The hulking black animal was faster than we thought. He spied us half way across the field, and trotted at us slowly. He picked up the pace, and suddenly he was snorting and barreling at us full speed. We hit the fence two steps ahead of him. In those days, my brother and I, at 5 and 6, had the full run of the town on foot or on our bikes. The noon siren called us home for lunch. Ann and Andy aren’t allowed off the block without permission. Julya captured the stark beauty of the Sand Hills in a remarkable windmill photo. Travel Tip: Think twice about using Priceline for booking motels. The fine print states that they do not guarantee a non-smoking room. Motel Super 8 has lots of smoking rooms, and twice we got put in one, to our great chagrin. If you check in late, you’re likely going to get one of these rooms, and they are truly wretched in those low budget hotels. Also, if you call the motel directly and tell them the Priceline price, they will often match it, and then you can select your room. 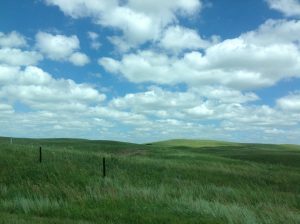 A few miles out of North Platte, the Sand Hills rise from the plains like a great stormy, green sea. The waves are steep, the troughs deep, and the wind often blows fiercely. You drive on the straight, hilly road for miles, without seeing a car or a cow, only endless barbwire fences and occasional windmills. Andy spots a cowboy boot stuck upside down on a fence post alongside the road; then a little farther on another, and another. Ann wants to know why the boots are there. All I know, in my years of driving the Sand Hills, where I lived several years as a boy after WWII, is that you are most likely to see the boots on the posts in the loneliest stretches of the prairie. From the backseat, Andy offers his explanation: When a cowboy’s father dies, he puts one of his favorite boots on a post to say goodbye. “You can’t know that,” Ann replies caustically. Julya and I trade glances. Can you spot the cows in the photo?